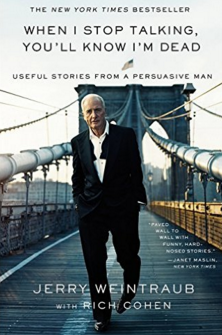 I recently read “When I Stop Talking, You’ll Know I’m Dead: Useful Stories From A Persuasive Man” by Jerry Weintraub (with Rich Cohen). Below are the quotes I found most interesting. If you like the quotes, buy the book here. “What had started as a ploy to snap Frank out of his depression had turned into a major deal – handled wrong, it could turn into a major embarrassment.